While society oohs and aahs over fancy sports car with crazy horsepower, there’s nothing as reliable and powerful as a good old-fashioned horse. Yes, horses are animals of a forgotten time. It wasn’t that long ago when horses used to be the main transportation vehicle. In the video below, you will see just how powerful and amazing horses really are. They are still a vital part of our society, even though we often fail to see it. A truck has slid off the road in the wintery weather conditions. It’s stuck in the ice on the side of the road, and it can not get out. With the weather worsening by the second, quick thinking and immediate action was required. There was no time to wait for a snowplow with road salt to move the truck. Fortunately, there were a few horses nearby. The owner of the horses lined his four reliable beasts up side-by-side. Then he tied them to the truck, and with a great amount of teamwork, the horses managed to pull the huge tanker out of the ice with no real trouble. 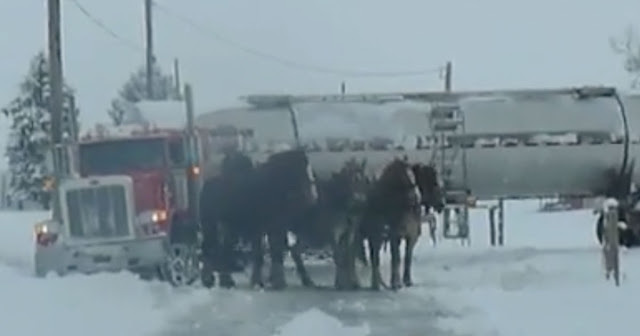 Although the horses slipped a little bit on the ice, none of them were injured while rescuing the tanker. The truck was able to resume the route to its destination, and the horses returned to their cozy stables for rest and food.